I have some nice indie polishes to share with you tonight - Cool Waves Lacquer from Never Naked Nails. 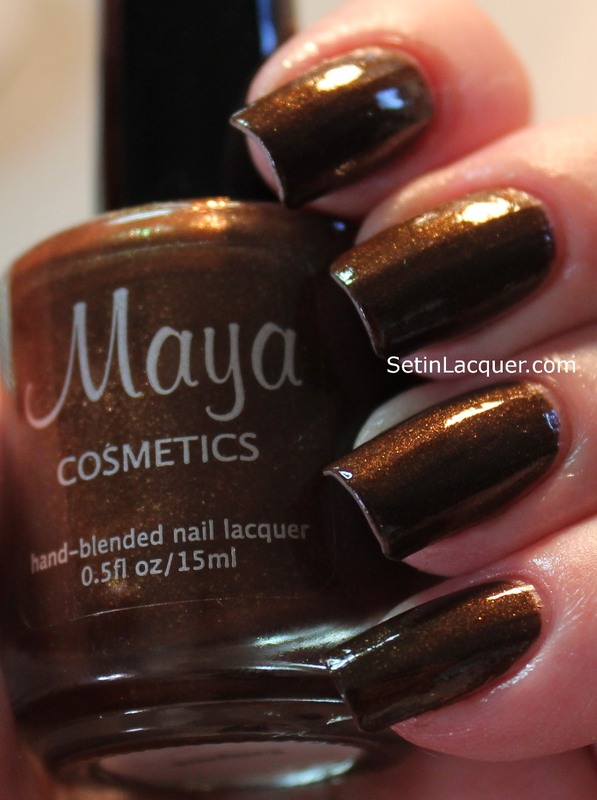 Cool Waves Lacquer will launch in the New Year. But the polishes have been in testing mode since July. The polish is handmade completely from scratch. No store bought polishes are used. 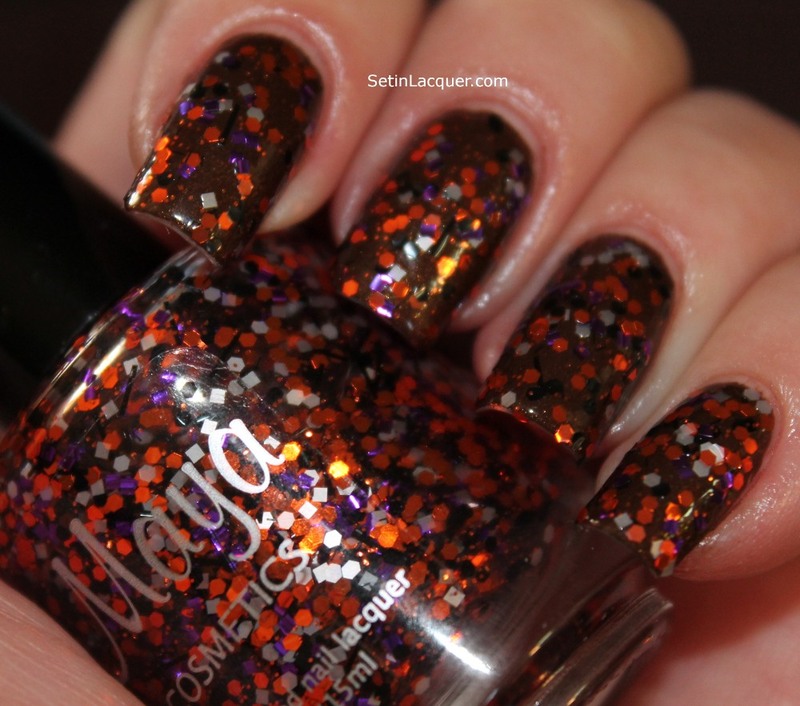 All of the polishes are made using various combinations of glitters, pigments, micas and 3-free lacquer bases. These polishes applied great. I didn't have to fish for glitter and it applied evenly. The dry time was pretty quick. I did not use a top coat for these swatches. Lizard Lamada is from the Lush Lizard Collection. 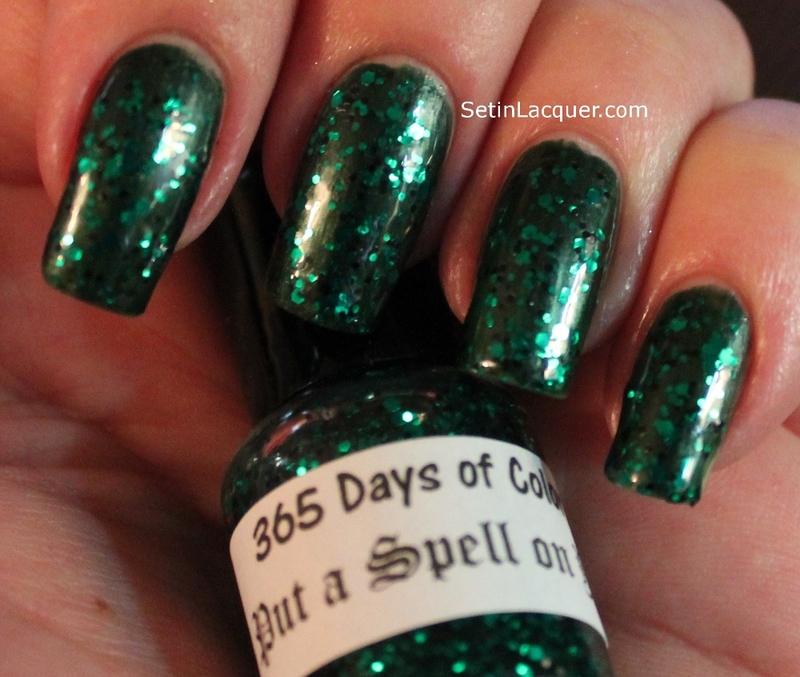 It is a green multi-sized holographic glitter in a green base. It is basically a top coat polish. I used several colors so you can see the possibilities. Orly "Jealous Much" is on the pointer finger. Milani "White on the Spot" is on the middle finger. Venique "Whiskey Vamp" on the ring and Milani "Black Swift" is on the pinkie. I used one coat of Lizard Lambada on each. Over the white you can really see that it has a light green base. 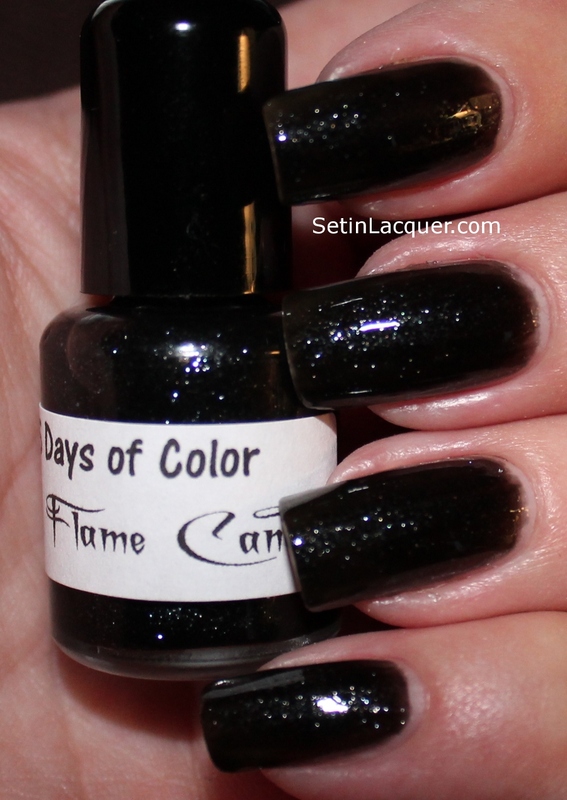 The final color is very similar to the swatch over "Jealous Much." Ole Fishin' Hole is multi-sized iridescent and regular glitter top coat and is from the Country Collection. It is in a light blue base. It has larger iridescent glitter pieces that really don't show well in the photos but add depth to the base. Venique "Whiskey Vamp" is on the pointer finger. Picture Polish "Sky" is on the middle finger. Barielle "Jordana's Skinny Jeans" is on the ring and Milani "White on the Spot" is on the pinkie. I used one coat of Lizard Lambada on each. I am pleased with the effects of these polishes. I would use a nice top coat to show off the shine more and smooth the finish. Cool Waves Lacquer and Polish Jewelry is available at her Etsy shop. Mini polishes are $4.50 and full size polishes are $8.50. 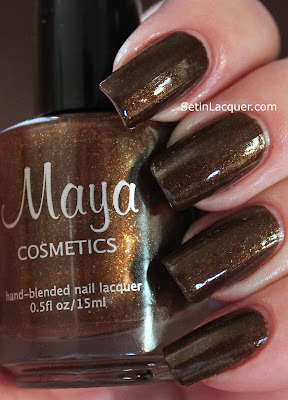 I received some samples of a new nail polish to share with you - Maya Cosmetics. 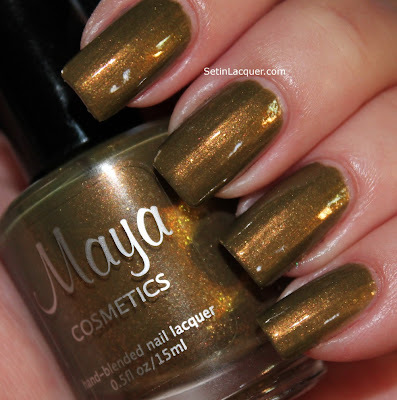 "We start with the basics--cosmetic-grade pigments and glitters and bases that are free of dibutyl pthalate, formaldehyde, and toluene--then hand-blend them into our custom creations" Maya Cosmetics website. The formula on these polishes is great. The shimmers applied wonderfully. They have a nice smooth application and a relatively quick dry time. The glitters are superb. Some glitters are very hard to work with but these apply evenly and don't require any "fishing" for glitter. Enigma - is a rich chocolate brown with tons of shimmer and shine. The polish applied beautifully and in two coats I had wonderful coverage. Hex - is a wonderful olive green infused with gorgeous gold shimmer. Again, application was a breeze. This is two coats. 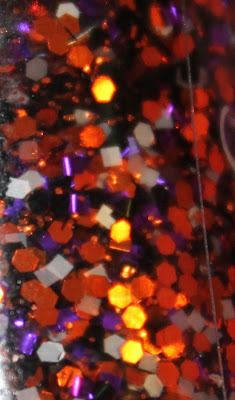 Hocus Pocus - is a multi-shaped and multi-colored glitter. Tons of orange, black, purple and white glitters swim in a clear base. Round, square, hexagon and bar glitter apply evenly. 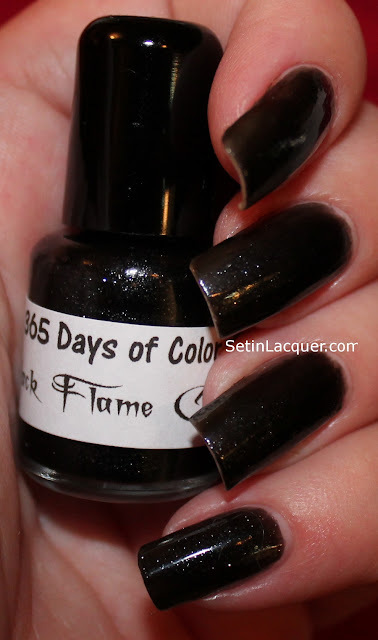 This is one coat over Enigma. Voodoo - is a glitter-packed bottle of glitz and glam. 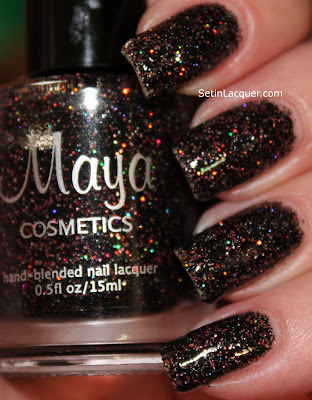 Multi-colored micro glitter (predominately black) are jam-packed in a clear base. This is three coats. Rainbow Honey has released a limited edition fall collection - The Yokai. I was sworn to secrecy on this release and was about to burst! Three glitter-infused polishes are being introduced. They will be available for purchase October 13 while supplies last at www.rainbowhoney.com. The formula on these polishes is great. Two coats provided wonderful coverage. They are thirsty polishes and need a good top coat. But I always use a top coat to protect my manicure. Let's have a look at these lovely polishes. The packaging is quite classy and chic. Kawako - The mischievous river child. A stunning navy blue jam-packed with silver glitter. This is two coats. This is my favorite of the collection. Kitsune - The magical white fox. A wonderful beige base with gold and red glitter. Oni - The malevolent wild demon. A jet black base with tons of gold glitter. It is simply stunning. This Rainbow Honey collection is a must for fall. Make sure to mark your calendar for the October 13, 2012 release! Just a quick swatch for you. Today I have a special Indie polish for you. Granite by NailVenturous. The wonderful lady behind the wonderful polishes at NailVenturous is not producing them anymore. So if you have one -hang on to it; and if you have a chance to grab one - grab it. Granite is full of tiny dots of black glitter with larger white and copper glitters in a milky white base. I really like the look of the polish. The name "granite" fits it well. Although the copper glitter didn't lay as flat as the glitter in "Robin Laid an Egg." Miss Kitty Mee-Yow -- Here Kitty Kitty! The wonderful lady Lisa from Cosmetic Sanctuary sent me a package for my birthday - Amazing polishes from Elixir Lacquers. I couldn't wait to try them. The one I am sharing with you tonight is Miss Kitty Mee-yow. It is the "purrfect" purple. A light shimmery purple with iridescent hues of azure blue. Unfortunately I couldn't get the camera to pick up the blue shimmery aspect of this polish. This is three coats. I could have worn a base color but I wanted to see the true colors come through. And I wasn't disappointed. Meow! 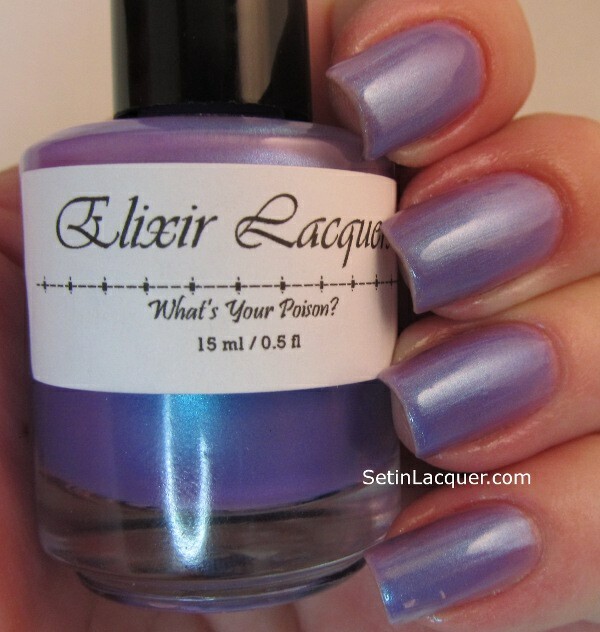 Elixir Lacquer is definitely going on my radar of Indies to watch. Right now she is having a sale. Elixir Lacquers are normally $10 but you can grab them for $8 until July 30th. What are you waiting for? Head on over to http://www.elixirlacquers.com/. I recently ordered from Dandy Nails. 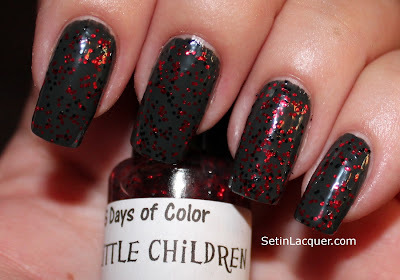 I love indie polishes and have some favorite Etsy stores to haunt. Dandy Nails is one of them. I purchased Bathed in Light, Look Around and You Set My Soul Alight. I am not a big glitter kind of gal so these seemed perfect. Don't get me wrong. I love glitter - it's gorgeous. But I love the microglitters - the larger glitters just aren't for me. 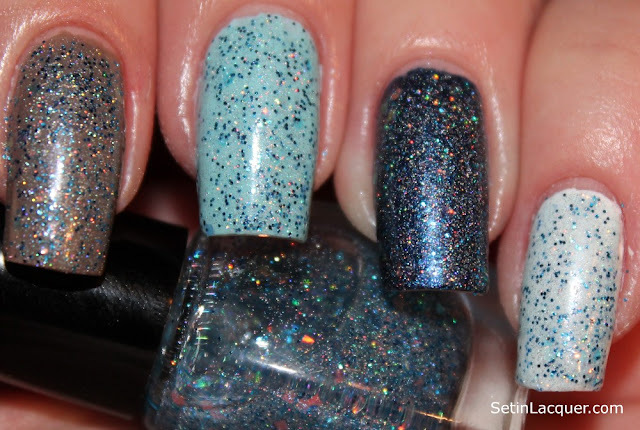 These three polishes are amazing - full of glittery goodness. The application was great. I only used two coats on each. Look Around and You Set My Soul Alight definitely needed a top coat to bring out the shine. But that wasn't a problem for me. I always use a top coat. This is my favorite of the three and it has secured a place on my list of all-time favorites. Bathed in Light is a gorgeous duo-chrome with holographic prisms. All the best of both worlds. The color shifts from a gorgeous gray to a shimmery pink. The holographic particles reflect the colors of the rainbow. 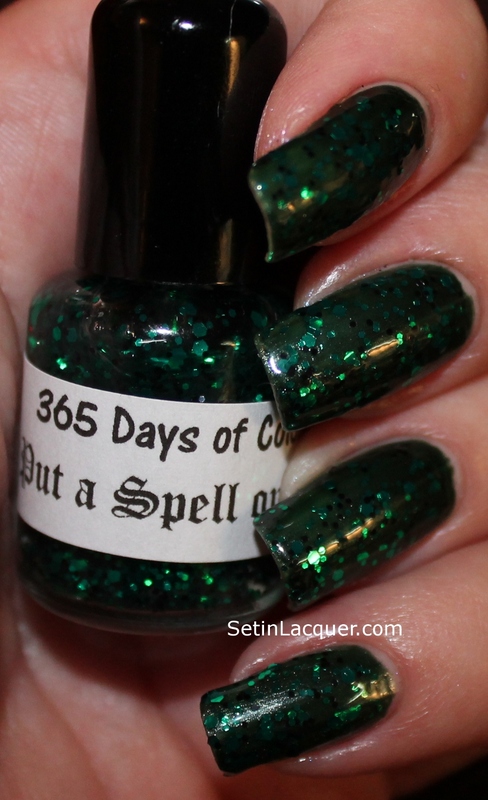 A must have polish for your collection. 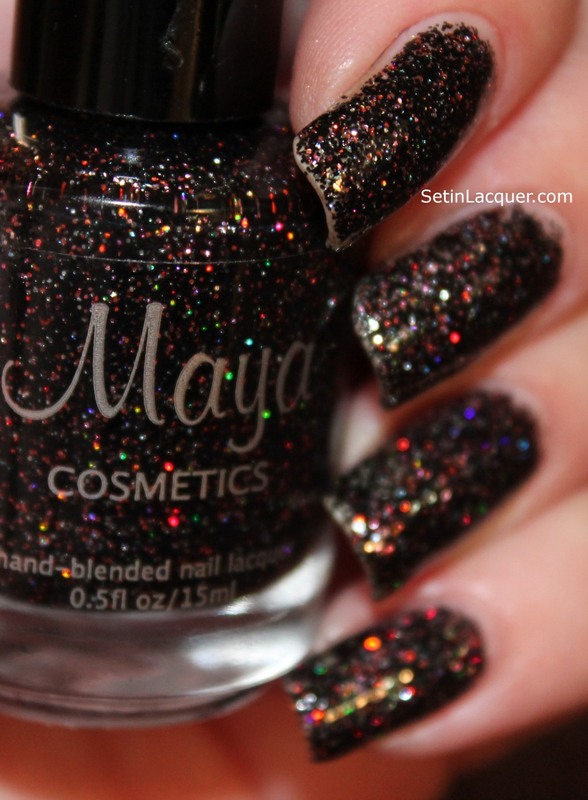 You Set My Soul Alight is a classic black with tons of micro holographic glitter throughout. Hard to capture on camera. I also notice I didn't clean up well enough after this manicure. But that doesn't mean you can't see all the fun glittery goodness. Bottom line: An indie polish that is classy, elegant and fashionable. I am going to have to check out some more of her polishes! Dandy Nails can be purchased for $8.